After login there are the terminal windows that was used during the previous startup with working directory and command history suddenly re-appear when I log again or start up my computer. These windows were saved with working directories and command history from my previous session. Help me to understand what the problem is please. 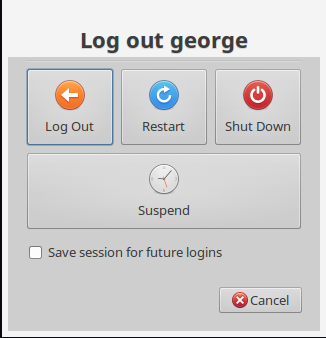 In Xubuntu and Ubuntu Studio (which both use the xfce desktop) there is the ability to save the current session state so that when you login again, apps from the previous session will automatically be launched into their previous state with the settings still intact. You can kill or stop this behaviour by deselecting the option to remember session on your session log out or shutdown dialogue box that appears when your about to shutdown or logout of your computer. Its perfectly normal. By selecting Save session for future logins you can quickly restore you system to its former state when you login or start a new session. You can also look in system settings > session management and change the session save and restore options there. Not the answer you're looking for? Browse other questions tagged xubuntu xfce4-terminal or ask your own question. How can I stop terminal and firefox from launching on startup?